2 Arrange chicken on rimmed baking sheet. Evenly top with Hellmann's® or Best Foods® Mayonnaise Dressing with Olive Oil, then sprinkle with bread crumbs. 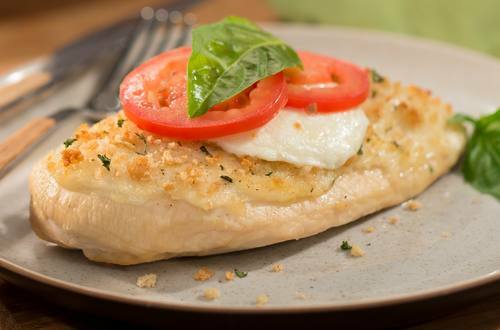 3 Bake until chicken is thoroughly cooked, about 20 minutes, topping with mozzarella during last 5 minutes of cook time. 4 Remove from oven and top with tomato slices and basil leaves. TIP: Delicious when drizzled with balsamic vinegar!